Why buy a Felt Letter Board or Small Chalkboard separately when you can have them in One Package for the Same Price! Have the best of both worlds with our sturdy high quality board. The perfect accessory for your home, office, classroom, bedroom, or studio! We want you to get creative have fun and show the world who you are with Snap Boards! Quality - Beautiful high quality board will make you proud to display your imagination and creativity. No Fuss - No need to buy extra letters or chalk we give you everything you need to get started. 340 vibrant white letters and easy to use liquid chalk markers= no messy chalk dust. Perfect Size - 10 X 10 inch is just the right size to display your messages.The size also makes it portable for the kids to use. Lifetime Warranty – If you are not satisfied with our board, return it for a full refund, if you do not love them, we will buy them back from you, no questions asked! BEST OF BOTH WORLDS : Letters on the front - Chalk on the back! Never get tired of being creative with this unique board. Our 10X10 inch high quality oak frame with Felt Letter board and durable Chalkboard/Blackboard combination offers you everything you need to be creative. THE COMPLETE PACKAGE : Our board comes with 340 vibrant white letter, symbols, and numbers, letter bag, easy to use stand, liquid chalk marker, and an eraser. CELEBRATE ANY OCCASION : No matter how large or small Snap Boards will help you stand out. Use it for home decor, weddings,engagement photos, birth announcements, inspirational quotes, parties, and birthdays. SOCIAL MEDIA : Become an Instagram and Pinterest Superstar with your board. 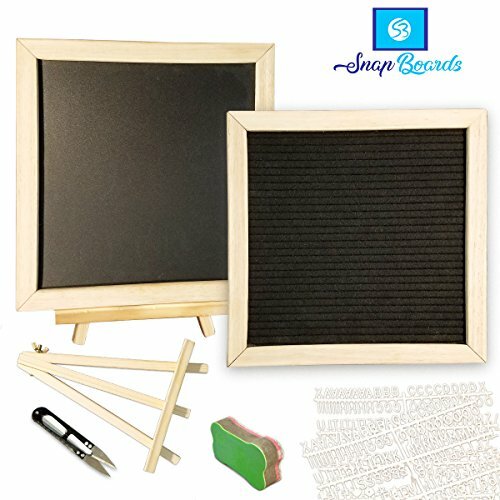 The double sided felt letter board/chalkboard lets you be as creative as you want with your photos. #snapboards. GREAT GIFT/EDUCATION TOOL: Perfect gift for teachers, college students,kids, moms, co-workers, or the artists in your life.Have you kids put down those smart phones and pick up a Snap Board. Great for school aged kids that are learning to read/write. Spell out words or phrases with the changeable letters and have them practice writing on the chalkboard. If you have any questions about this product by Snap Boards, contact us by completing and submitting the form below. If you are looking for a specif part number, please include it with your message.